Second bake of The Home Bakers (THB), Apricot-Pistachio-Lemon Coffee Cake, chosen by Chris of Yummy Bakes. Pistachio is not an ingredient that I use very often, mainly because they are quite costly, yes, I am sometimes that stingy when it comes to certain ingredients! I bake quite often, so budget is always on my mind, as it can be quite costly shopping for ingredients! Most of the time I ended up buying more than I need, yikes!! Almost all of the nuts here in Malaysia are fully imported, that's one of the reasons why they are so expensive! But for these, I could not find myself substitute with walnuts (much cheaper than pistachios), which I often do! So pistachios it is! I bought a small pack of 250gm since this recipe does not use much pistachios, and now I have some balance I'm keeping for other bakes! (yipee!!) !! 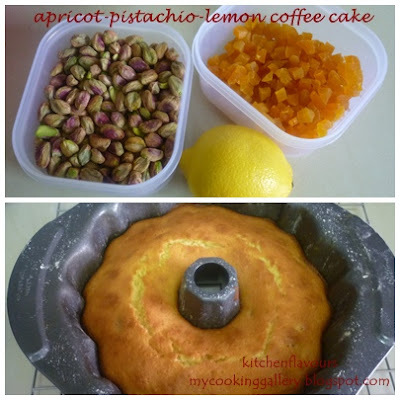 My favourite ingredients, apricots and lemons, and of course the pistachios! I only made half the recipe and bake it in my 9-3/4" bundt pan for 35 minutes. I like the lovely golden brown of the crust. While this cake is baking in the oven, I can smell the mixed aroma of the apricots and lemon, really nice. Apricots are my favourite dried fruit (I even have a label for apricots in my side-bar!!) and I simply love lemons! I did reduced the sugar slightly, and it was just right for us. This cake is really nice, there's a light lemony taste and fragrance, with a lovely combination of the tangy apricots and pistachios. I had this with a cup of warm Earl Grey tea. Please visit our other baking friends at THB for this bake and hop over to Chris from Yummy Bakes for the recipe. 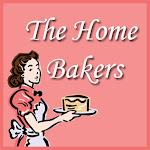 THB is currently baking from Coffee Cakes by Lou Seibert Pappas, if you would like to join in, please hop over to THB for details on how to become a member. Everyone's welcome! Young and tender leaves, great for garnishing. My kids loves mashed potatoes, and I made this Garlicky Mashed Potatoes for their after school meal, as a side, together with some baked ham and eggs and some fresh cucumber and tomatoes. Of course, this is a winner, they love it! The potatoes and garlic are first boiled till tender and mashed with warm milk, butter, season with salt and pepper. I did remove half the garlic before I mashed them up as the taste can be quite strong. Garnish with some chives and more coarse black pepper, yum! 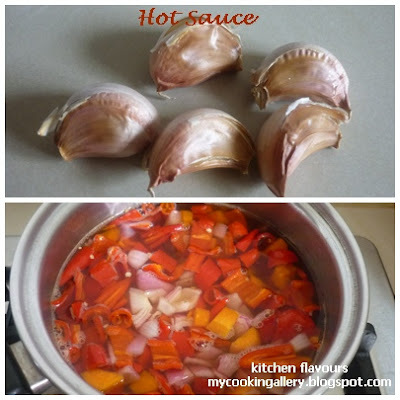 Do stop by I Heart Cooking Clubs and see what the others have come up with. If you would like to join us for some Mexican fiesta cooking from Rick Bayless's recipes, you can find out more details from IHCC. Put potatoes and garlic cloves into a large saucepan with salted water to cover. Bring to a boil, reduce heat to medium-low; cook until potatoes and garlic are fork-tender, about 20 minutes. Drain and return potatoes and garlic to the pot. Set the pot over low heat and add the milk or half-and-half, butter and salt. Mash with a potato masher until as smooth as you like. Taste and adjust the seasonings. Transfer to a warm serving dish and sprinkle with chives. I made some Applesauce sometime back and really needed to use up that jar before they become "unusable"! This Applesauce was meant for a bar recipe but somehow never came round to make it! Yikes!! So that jar has been sitting in my fridge for weeks. I looked through my many cookbooks, and finally settled on this cake, just because it is absolutely easy, quick and a breeze to make! I'm feeling a little bit lazy that afternoon! It all takes about 2 minutes of mixing the ingredients! Seriously, just 2 minutes! And the result is a delightful, delicious cake! I did reduce the amount of spices calls for, as we like just a hint of the fragrance from the spices. As usual, I reduced the sugar to slightly less than a cup, since my applesauce is lightly sweetened, and it works out just right. You could however, use storebought unsweetened applesauce. And I used a square 10" pan for this cake. This is one lovely cake, the texture is soft, tender and moist! The original recipe comes with the frosting of Cinnamon Icing which I skipped, as I think it is perfect just as it is! In a large bowl, whisk together flour, sugar, baking soda, cinnamon, baking powder, salt and allspice. Add eggs, 1/2 cup (125ml) of the applesauce, butter and vanilla to flour mixture. Using an electric mixer on medium-low speed, beat for 1 minute, until blended. Scrape sides and bottom of bowl with a spatula. Add the remaining applesauce and beat on medium speed for 1 minute, until just blended. Gently stir in raisins. Bake in preheated oven for 35 to 40 minutes or until a toothpick inserted in the center comes out with a few moist crumbs attached. Let cool completely in pan on a wire rack. Spread icing in a thin layer over top of cooled cake. In a small bowl, whisk all ingredients together until blended and smooth. Use immediately. Store the iced cake, loosely wrapped in foil or waxed paper, at room temperature, for up to 3 days. Alternatively, wrap the cooled, un-iced cake in plastic wrap, then foil, completely enclosing cake, and freeze for up to 6 months. Let cake thaw at room temperature for 4 to 6 hours before icing and serving. Hello senoritas!! Time for another date with Rick Bayless! A really hot date! LOL!! This week's theme at I Heart Cooking Club is "Sauces and Salsas". And I made some hot chili sauce, Rick Bayless uses habanero chillies which I read are really hot stuff, and of course I could not find any habanero over here, so I substitute with some fresh red chilli and really hot bird's eye chillies instead. It would be really Mexican if I can find some habanero chilli peppers! Sour and very spicy! Really hot stuff! Fresh chillies, not hot enough? 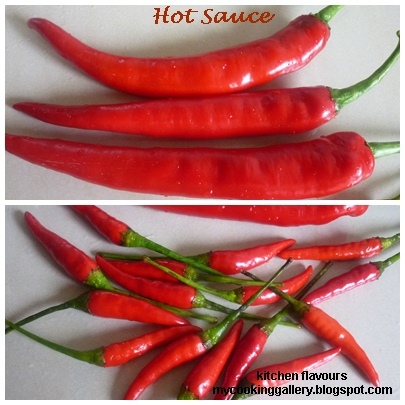 I added in bird's eye chilli, these are hot!! The unpeeled garlic are roasted over medium heat till soft. The rest of the ingredients are mixed in a saucepan, simmer over medium-heat, partially covered until carrots are tender, the recipe says about 10 minutes, but mine took about 20-25 minutes, and I even chopped the carrots to small pieces! I let the boiled mixture cool to lukewarm before blending, do not want to crack my blender! The peeled garlic, salt and sugar are added in and blend everything together until smooth. The sugar used is very little as this is a sourish and spicy hot sauce. At first I thought that this is a chilli sauce, you know, the kind of chilli sauce that uses tomato as the base but this uses carrots instead, but then once I tried it, I realize that this tastes similar to Tobasco hot sauce, but a thicker version! Pour into a jar and store in refrigerator. Serve with some fried chicken wings and some cucumbers. The sauce is slightly sour and really spicy, just as a hot sauce should be. The jar will last me quite awhile, as this is too hot for my kids. My hubby do not take overly spicy stuff, so I will slowly enjoy it myself, with some packed in small jars for my sisters, we love spicy stuff! Yum! I love crispy chicken wings and together with this hot sauce, so good! To see what the others have made, please drop by I Heart Cooking Club. Scali Bread is the signature bread of Boston's Italian-American community. According to the book, the Scali family of Boston once specialized in this bread, which is now a fixture in grocery stores, bakeries and cafes in the area. It is light-textured, usually braided and sprinkled with sesame seeds. 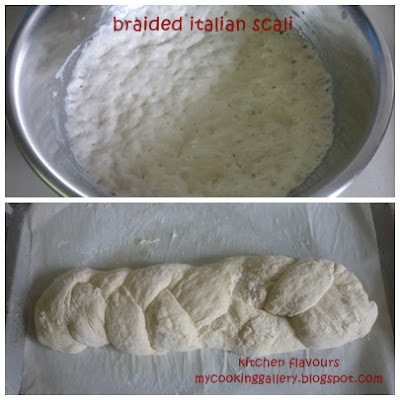 I have never heard of Scali Bread before this, and now it is in my to-make-again list! This is one delicious bread! This bread starts off with an overnight starter. Water, flour and yeast are mixed, covered and leave for at least 12 hours or overnight. When it's ready (starter will rise and have small bubbles), scrape into the bread machine pan, add in the rest of the ingredients, select Basic Dough cycle. I find that the dough is really wet, so I added in about 1/4 cup more flour to the bread pan. Once dough is ready, scrape the dough onto a lightly floured surface and divide into three equal sizes. Dough is very soft and sticky, I sprinkled more flour on work surface and on the dough. Flour your hands. Shape each piece into a 16" long roll. Make into a plait, it was quite difficult as the dough is really soft! Transfer the dough to the baking sheet, again is not an easy task! Covered, leave to rise for about 30 minutes. Once the dough has risen, brush with beaten eggs all over and sprinkled some sesame, pressing the seeds gently. Bake in a preheated oven at 220C for 25 minutes. 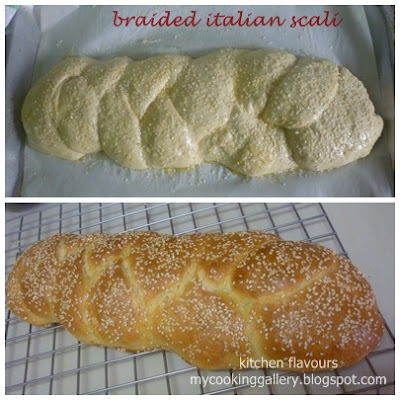 This Braided Italian Scali Bread has a soft crust, with soft, moist and wonderful texture. The sesame seeds adds the nutty taste and fragrance to this lovely bread. I really like the crust! I ate a slice, spread with some butter and raspberry jam, delicious! This bread is also suitable as a sandwich bread, may also be served with pasta or with soup. An all-purpose bread! Starter : In a bowl, combine flour, water and yeast. Cover with plastic wrap and let rise at room temperature for 12 hours or overnight. Dough : Transfer starter to the bread pan. Add water, milk, oil and salt. Spoon flour on top of liquid. Add yeast. Select the Artisan Dough or Dough cycle and press Start. When the cycle is finished, transfer dough to a floured surface and punch down gently. Divide dough into thirds. Roll each third into a 16-inch (40cm) long rope. Braid ropes together, tucking ends under. Place on prepared baking sheet. Cover with a clean towel and let rise for 30 minutes. Meanwhile, preheat oven to 425F (220C). Topping : Brush braid with beaten egg and sprinkle with sesame seeds, pressing the seeds into the dough. Bake for about 25 minutes or until risen and dark brown and an instant-read thermometer inserted in the center registers 190F (90C). Remove from pan and let cool on a wire rack. Focaccia has been on my mind lately, even before I bought my new book, bake! by Nick Malgieri. And ever since I've seen this focaccia with potatoes and gruyere cheese from this book, it has been bugging me everyday! Yup, everyday! So instead of staring at the photo and kept reading the recipe from the book almost everyday, I went right ahead to make this over the weekend. Just like most focaccia, no kneading is required. This is fairly easy. The yeast and water are mixed together, add in the olive oil, flour (I use bread flour) and salt. I used my stand mixer, with the paddle attachment, to beat the dough for 15 seconds. The recipe says to beat vigorously for 15 seconds by using a spatula, I don't think I can do that, as the dough is soft but really thick, and to beat vigorously gonna take much effort, even if it is only 15 seconds! Hehe! So, that's where my stand mixer comes in handy. Cover the bowl and leave to rise until doubled in size, about 1 hour. I use the pan size of 30cmx30cm, it is a little bit smaller that what is required, it's OK, the focaccia will be a little bit higher that's all. Coat the pan with olive oil, I only used 45ml (3 tablespoon) instead of the original 60ml (4 tablespoons) as the pan size is smaller and the oil seems quite a lot to me! Very carefully scrape the very soft dough into the pan, taking care not to overlap the dough. Gently reach under the dough with both hands and flip dough over, so that the surface that is coated with oil is now the top. Using the palms of your hands, slowly stretch dough to cover the pan completely. There was some resistance, so I left the dough to rest for 10 minutes, before I continue on with the stretching. Dough will be oily so it would not stick to your fingers. I did thought that it was a little oily and was kinda worried how it would turn out. But not to worry, once it is baked, it would not be greasy at all, and the oil actually makes the release of the focaccia from the pan a breeze! Once it has been stretched to cover the pan completely, cover with cling film and leave to rise for about 30 minutes until puffy. Using your index finger, make indentations or dimples on the surface. While the dough is rising, prepare the potatoes as per instructions below. I sliced the potatoes manually using a sharp knife. According to the recipe, slice the potatoes as thinly as possible, but I sliced them just a wee bit thicker than that. Arrange potatoes slices over dough, sprinkle some salt and pepper all over. I use Cheddar Cheese as I do not have Gruyere Cheese. Sprinkle some grated Cheddar Cheese (or Gruyere) all over, drizzled with 1 tablespoons (original recipe uses 2 tablespoons) all over and bake in preheated oven for 30 minutes, mine was done at about 35 minutes, as my pan is smaller resulting in a higher focaccia. 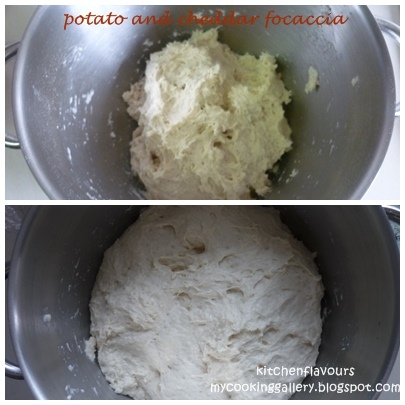 According to the recipe, check the bottom of focaccia at halfway baking time to see whether is the bottom browning too fast, if it is, slot a baking pan under the focaccia pan to insulate it. I checked mine, and the colour was still very light, so I just let it be. Once the focaccia has completed baking, loosen the sides of focaccia with a spatula, invert it onto a wire rack, remove the pan (really easy!) and re-invert it back again to another wire rack to cool. I was waiting impatiently to bite into one, I let it cool for about 20 minutes, then slice, and quickly devour one slice! These are so good! The best focaccia I've eaten! The topping of potatoes, cheddar cheese and the black pepper are just so delicious, along with the fluffy bread, is fantastic! At first, I did thought of making half the recipe, but am really glad I did not! This makes quite a lot, so the next morning, I wrapped it in aluminium foil, pop it in the oven for 10 minutes and it tastes just as soft and delicious! I've found my new favourite focaccia! In a large mixing bowl, whisk the yeast into the water. Wait 2 minutes and whisk again to make sure the yeast is completely dissolved. Whisk in the oil. Use a large rubber spatula to smoothly stir half the flour mixture into the liquid. Stir in the remaining flour mixture, using the spatula to dig up any unmoistened flour from the bottom of the bowl. After all the flour is moistened, scrape any dry bits from the side of the bowl and incorporate them into the dough. Use the spatula to beat the dough vigorously for about 15 seconds. Cover the bowl with clingfilm and let the dough rise until it has doubled in size, about 1 hour. Scrape the dough into the tin, being careful not to fold the dough over on itself. Reach under it and flip it over - now the top is coated with oil. Use the palms of your hands to press the dough into the tin. If it resists, cover, and let rest for 10 minutes, then press again to cover the entire base of the tin. Cover with clingfilm and let rise until puffy, about 30 minutes. Set a rack in the lowest level of the oven and preheat to 230C/gas mark 8. Peel the potatoes and cut them as thinly as you can; I use the little slicing blade on the side of a box grater. Slide into a saucepan, cover with water and bring to the boil over a medium heat. Drain, rinse and set aside in a colander. Once the focaccia is risen, use your index finger to dimple the top all over at 2.5cm intervals. Cover with the potato slices, slightly overlapping them. Season with a little salt and pepper and evenly scatter on the cheese. Drizzle with the olive oil. Place the focaccia in the oven and reduce the temperature to 220C/gas mark 7. Bake until the dough is firm and the topping is golden, about 30 minutes. About halfway through the baking time, use a wide palette knife to lift the corner of the focaccia to check that the base is starting to colour. If it is colouring too quickly, slide another tin under the tin the focaccia is in to insulate it. Slide the baked focaccia to a rack to cool so that the base doesn't become damp. Hi to all you lovely Senoritas!! Second week of Mexican yummies with Rick Bayless at I Heart Cooking Clubs, with this week's theme "Sweet Tooth"! So I made Paletas!, otherwise known as Iced Fruit Pops! The word "paleta" translated means "blade" or "stick". Mexican Paletas have been called Mexican Popsicles or frozen fruit bars. Whatever names they are called, they are refreshingly yummy! I'm sure that most of us, at some time or other have made our version of Popsicles. Well, for this post, I'm sticking with the name "Paletas", it sounds more Mexican and "sophisticated" since this is a post on Mexican cuisine (in this case, dessert!) after all! And saying "Paletas" makes me feel a little bit closer to Mexico! LOL! I used two ripe mangoes for these, you may use any fruits you want. No exact measurement, simply taste and adjust to your taste. You may follow the instructions as per the recipe below, or just follow what I did, pureed EVERYTHING in the blender, then pour into paletas mould and freeze. I only have one set of 4 popsicle moulds, so I froze the balance in long plastic that was meant for our local ice cream. The difficult part is the waiting! Yup, the Paletas takes a couple of hours to freeze! Just cut them up in equal lengths, still in the plastic, poke the stick gently right in the middle about halfway through and remove the plastic! It will be easier to do this when the Paletas are almost frozen. Cut them up, insert the stick about halfway through and continue freezing until hard. Surprise the kids with these after their afternoon meal, when they are back from school, hot and hungry! Will definitely bring a smile! They did mine, and they are asking me, "Mommy, what flavour are you making next?" !!! This post is linked to I Heart Cooking Clubs where the theme is "Sweet Tooth". Please do visit IHCC for other delicious Mexican desserts! In a medium-size bowl or in a 1-quart measuring cup with a pour spout, combine the fruit with the minimum quantities of sugar and lime. Taste and determine what your fruit needs. Remember : when the mixture is frozen, flavours will be slightly muted, go for slightly sweeter and slightly tarter than you'd normally like. Stir the mixture until the sugar has dissolved completely, then fill your moulds, leaving about 1/4 inch of head space to allow for expansion. Set the lids in place and insert the sticks through the holes, leaving 1-1/2 to 2 inches exposed. Freeze until firmly set (this should take a couple of hours, though feel free to make them several days ahead if that's more convenient). To remove the pops, first remove the lids, then squeeze the sides of the mold, twisting them slightly, to dislodge the pop. (If necessary, rinse the molds under hot water first). These look festive and fun set out for your friends in a chilled bowl, all the sticks poking up.